Today we are going to do a little paper weaving. Remember making those pot holders on the square loom when you were a kid? Well, same idea. by 7" long. Then I used a sponge applicator and green dye ink to distress the edges. your 4 1/4x51/2 inch piece of card stock in the same color with adhesive applied, and lay it on the back of the woven square. I laid mine on a small slant. Cut the excess from each of the four sides of the edges of the piece you just covered. The finished card. I matted the woven piece with green textured card stock. The butterfly designer paper is Graphic 45, Little Darlings Collection. Butterfly die is Martha Stewart. that has been embossed, or emboss the strips after cutting for even more texture. o wow beautiful done Sue it looks great. WOW!! Your paper weaving looks wonderful Sue. I like the way you have inked the edges. Sue, you did a fabulous job with this weaving. 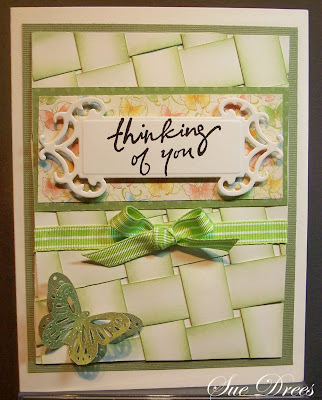 I like to space between the strips and you have the perfect amount of sponging to create some nice dimension. A lovely card. Enjoy your week ahead.